Throughout Italy, various villages and towns hold an annual sagra or festival, very often dedicated to a specific locally grown or produced food, such as frogs, chestnuts or onions, or a local dish such as frico, polenta or risotto. A quick search of the various sagre in Italy will reveal many festivals devoted to pumpkin but not to zucchini. If you think about it, the pumpkin or Zucca is the Zucchino‘s much bigger sister. Orange versus green. Female versus male, fat and rounded versus thin and elongated. Anything you can do with a pumpkin can be adapted to the zucchino; stuff, fry, bake, layer, grate and soup them. Oh and pickle them too. It’s high time to announce my own Zucchini Sagra. Come along and try my new zucchini recipes this month, or better still, suggest some more unusual ways of using this prolific garden beast. My first recipe marries some young zucchini with prawns, spaghetti and mint in a rich sauce. The links at the bottom of this post will take you to some of my previous posts on this wonderful annual vegetable. Spaghetti con Zucchini, Gamberi e Menta Serves four people. Meanwhile add 2 tablespoons olive oil to a large non stick pan over medium heat. Add the garlic and saute for a couple of minutes. Add the zucchini and cook for 2- 3 minutes until coloured. Add the chilli and anchovies, squash them into the oil, then add the wine. Allow the wine to evaporate a little then add the butter. Bring to the boil for a minute or so, then add the prawns, stir about then remove from the heat. Cook the spaghetti in the boiling salted water until al dente. Drain, then add to the prawns. Pop the pan over high heat, tossing and stirring to combine all the ingredients. Add the parsley and mint. As soon as the prawns are opaque, remove from the heat. Season with salt and pepper and add a tablespoon of olive oil. Serve. The amount of spaghetti specified in this recipe would be suitable for an entrée or light luncheon. I would suggest adding more pasta to the pot, say, around 80 g per person, for a main meal, with a green salad on the side. I also used a large non stick wok, which is a better utensil to hold the volume of ingredients for the final tossing. The sauce, made up of oil, garlic, anchovy, wine and butter, is an excellent base for any marinara you might make. From Cook Like an Italian, Tobie Puttock 2010. Posted on January 17, 2017 Author FrancescaCategories Italian Culture and Cuisine, pasta, RecipesTags butter, Cucina italiana, gamberi, menta, mint, olive oil, pasta, prawns, seafood, spaghetti, zucchini27 Comments on The Annual Zucchini Festival. It was in Castellina in Chianti, just north of Siena, in 1993, when I first ate Tagliatelle con Burro e Salvia. I remember the day quite vividly. At the time I was studying Italian at the Scuola di Dante Alighieri per Stranieri for a month and, as school attendance required me to be present only from 8 am to 1 pm, I had the rest of the day, as well as each Sunday, to roam around Siena and Tuscany, often taking the local bus to a small village, followed by a lunch and a stroll. It was on one of these jaunts that I ended up in Castellina in Chianti, and not long after hopping off the bus, I was drawn to a modest ristorante where a big pile of freshly made tagliatelle was laid out on display. I was in like a shot. Although seemingly a very simple dish, fresh tagliatelle with butter and browned sage leaves does require some hours of preparation. There is no point making this dish with dried pasta or even shop purchased fresh pasta. This is where I get bossy. The pasta must be freshly made up to two hours before. This is why it tastes so good and comforting. 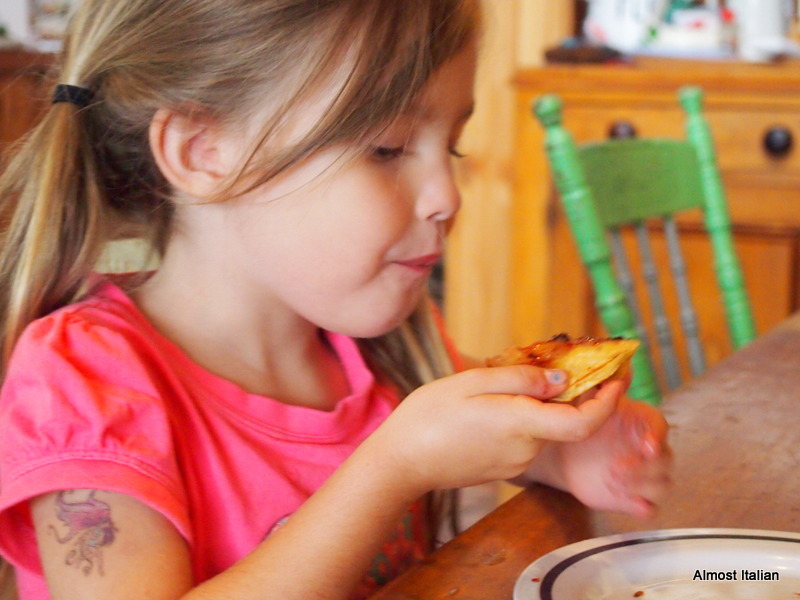 Making pasta at home is an easy process if you have a little time AND a helper. I never make pasta on my own, but when young Daisy Chef is around, what seems like a tedious business becomes a joy. We flour up the benches, get the aprons on and make a load of yellow snakes. She loves to crank that handle and feed the stretched pasta through the wide cutting blades. Make the pasta dough either by hand or in a food processor. I simply place these two ingredients into the food processor and pulse until the dough clumps together. If it doesn’t, have another small beaten egg on hand and add it, bit by bit, until the pasta clumps. Don’t over process it. Feeding the pasta through at number 5. Flour the bench well. Feed the dough through the pasta machine, twice at each number, from 7 to 5, then once on each number down to number 2. If the dough sheets get sticky along the way, dust them with more flour. Feed the long sheets through the tagliatelle blade, then place them on a large flour covered tea towel and toss around so that the strands don’t stick together. Cover the pasta with another tea towel until ready to use. Boil up a large pot of water and add ample salt. Cook the pasta until al dente- two minutes is usually enough but this will depend on how long the pasta has been resting. Meanwhile, melt some unsalted butter in a wide frying pan and cook some sage leaves until crisp. Remove. Then add more butter to the pan to melt. Return the sage leaves. The butter is main sauce so be generous, around 40 g for two serves. Drain the tagliatelle and toss through the butter and sage in the pan. Add some freshly ground pepper or nutmeg. Serve with lots of freshly grated grana padano or reggiano parmigiano. Radishes are the hidden gems of the too green Spring garden, crunchy crimson jewels waiting to be devoured, usually on the spot. Those that make it inside become a French treat, as an appetiser or a Spring breakfast. Harvest a bunch of radishes, trim the roots and wash well in cold water. Arrange on a platter. Serve with softened French butter, cultured butter or the best butter you can get you hands on. Also add a small bowl of fleur de sel, Murray Pink salt flakes, or Maldon salt flakes. Select a handsome radish, cut a cross in the top, squash in a bit of butter, then dip the buttered end into the salt. Feel the earthy, crunchy, salty, sharp, creamy, fresh explosion in your mouth. The success of this simple dish relies on the freshness of the radishes. Radishes mature quickly and require fortnightly reseeding. They don’t need much room, just friable, well-drained soil. Kids love growing them too. Cherry Belles are my favourite variety but the longer crimson and white French Breakfast is a stunning, milder cultivar, more suited to stuffing with white butter. 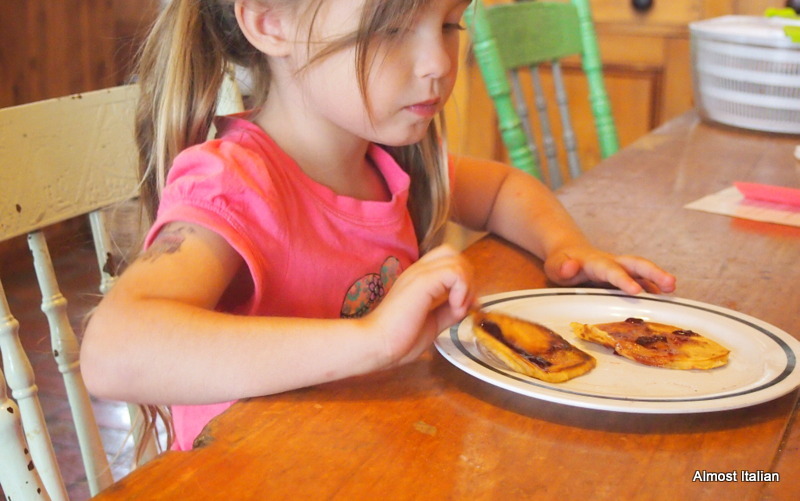 Celia’s Pancakes for a Miserable Day. This summer was so cool that most of the tomatoes died off last week and the eggplants won’t have time to mature. Now Autumn feels like winter. Here we are midst the best month of the year and today the temperature plummeted to 12 c. What happened to my Keatsian season of mellow fruitfulness, close bosom friend of the maturing sun? Time to light a lovely wood fire and renew my acquaintance with baking, butter and wonderful winter treats. Like many others around the world who received a gift of sourdough starter from Celia, of Fig Jam and Lime Cordial, I have religiously fed mine, (who is also named Celia ) since last July and have often been forced to throw out the excess, especially during summer when bread making wasn’t on the agenda. Today’s cold produced a spate of frenzy in the kitchen, with soup stock on the boil and a batch of sourdough pancakes for afternoon tea, using Celia’s recipe which can be found here. 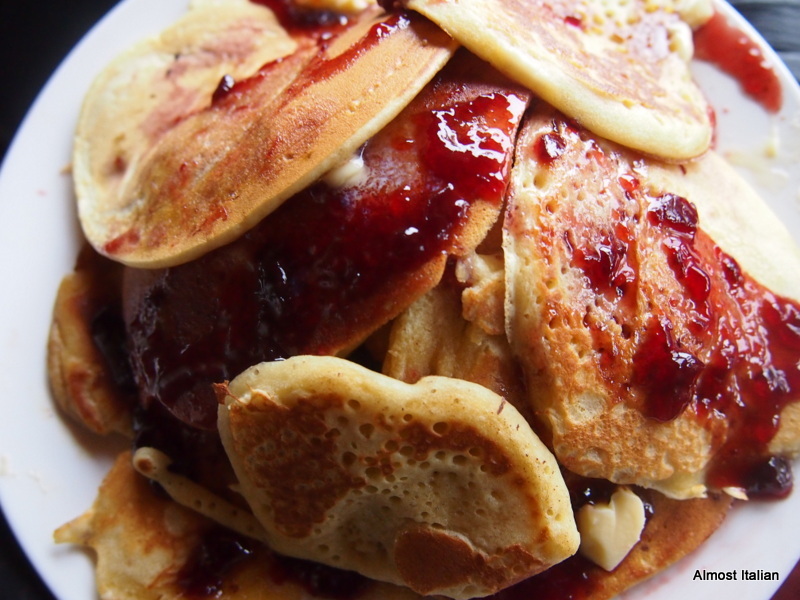 After cooking, I simply piled them on a plate, dotted them randomly with dabs of butter and drizzled them with cherry jam. I made about 25 and there are only 2 left. Who needs dinner? Daisy loves food, any food that is home made! If you have an excess of sourdough starter, I highly recommend Celia’s recipe. 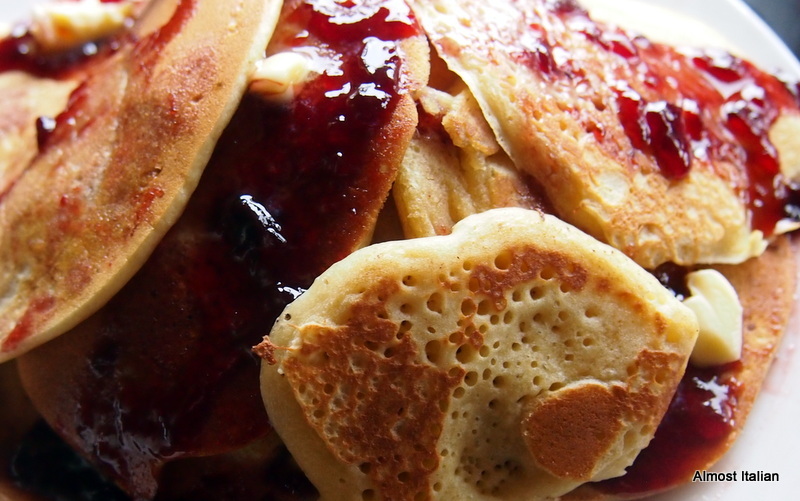 Don’t waste that sourdough starter: pancakes (or pikelets ) never tasted so good. 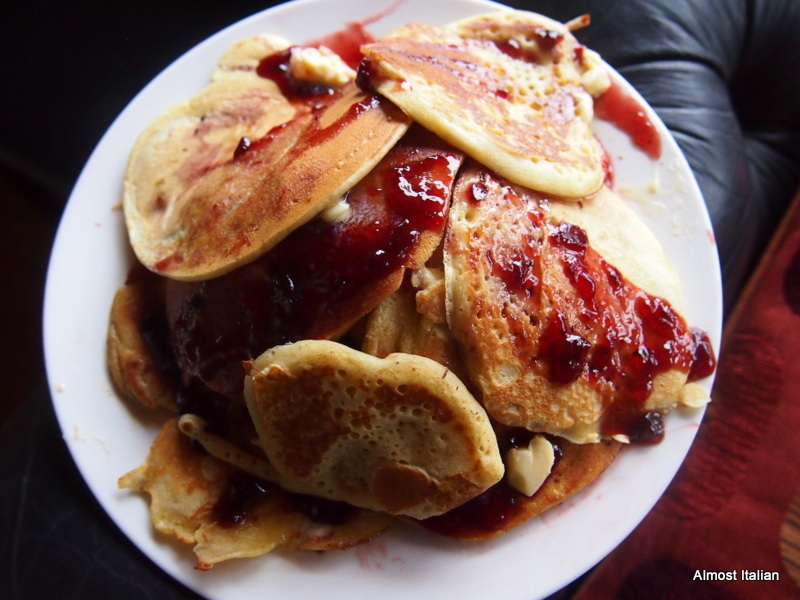 Posted on March 24, 2015 March 24, 2015 Author FrancescaCategories Budget, RecipesTags autumn, butter, cherry jam, Keats, pancakes, recipe, sourdough, starter, winter37 Comments on Celia’s Pancakes for a Miserable Day.